Exposure to chronic intermittent hypoxia (CIH), the main feature of obstructive sleep apnea, produces autonomic and cardiorespirartory alterations, and leads to systemic hypertension. These alterations are associated with enhanced carotid body (CB) chemosensory and ventilatory hypoxic reflexes and a decrease baroreflex (BRS) efficiency. The aim of this study was to determine the therapeutic effect of CB ablation on the elevated arterial blood pressure, the reduced BRS and the potentiated ventilatory response induced by CIH in conscious rats. Arterial blood pressure (BP) was continuous measured by telemetry in male Sprague-Dawley rats exposed to CIH (5 % O2, 12 times/h, and 8 h/day). After 21 days of CIH, the CBs were selectively cryodestroyed, and rats were kept one more week in CIH. Ventilatory responses to hypoxia were assessed by whole body plethysmography and spontaneous BRS measured by the sequence method. Exposure to CIH produces hypertension, increased the chemoreflex ventilatory hypoxic responses, and decreased BRS. The ablation of the CBs normalized the elevated BP, and the altered ventilatory response and BRS. 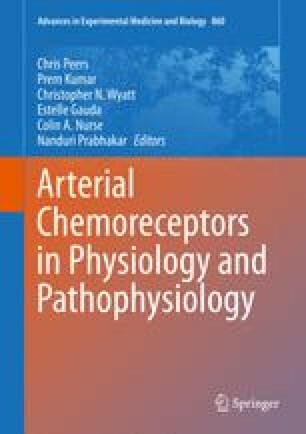 Present results suggest that the CB play a crucial role in the development of high arterial pressure and autonomic alterations induced by CIH. This work was supported by grant 1100405 from the National Fund for Scientific and Technological Development of Chile (FONDECYT) and the project Puente 28/2014 of the VRI-PUC.